Curd sandwich prepared with hung curd mixed with fresh veggies makes a perfect breakfast and snack. This tempting curd sandwich can be served with any sauce or dip or green coriander chutney. You can even pack them in lunch box for kids, they will devour eating them for sure. To prepare the curd sandwich start with making the hung curd. For this, take curd in a plain cloth and tie it up nicely. Now hang this cloth on a edge of the bowl so that excess water drains out from the curd completely and you will get thick-dense curd left over the cloth. For making the sandwich, mix veggies and spices to the hung curd. For this, take hung curd in a big mixing bowl and to it add chopped cabbage, capsicum, carrot, green coriander, crushed black pepper, ginger and salt. Mix everything really well. Stuffing for making the sandwich is now ready. Take a bread slice and layer some stuffing over it. After evenly spreading the stuffing over the bread slice, place another bread slice over it. Likewise prepare rest of the sandwiches as well. You can use two different methods for roasting the sandwiches – on a griddle/tawa or griller. Preheat a tawa on a flame and spread some ghee over it, evenly. Now place two stuffed sandwiches on the tawa to roast. Apply some ghee over the sandwiches and flip the sides when it turns brown from beneath (you can adjust the quantity of ghee while applying on the sandwiches). Now let the sandwich roast from other side as well until it gets golden brown in color. When the sandwich is roasted well from both the sides, turn off the flame and transfer them to a serving plate. Sandwiches on the tawa are ready. Apply some ghee over the stuffed sandwiches and place them one by one inside the griller. Apply some ghee on the other side of the sandwich as well. Close the lid of the griller and roast for 3 minutes. After 3 minutes, open the lid of the griller and check the sandwich. Golden brown curd sandwiches are ready, transfer them in a plate. Divide the sandwiches diagonally using a knife and place them on a serving plate. 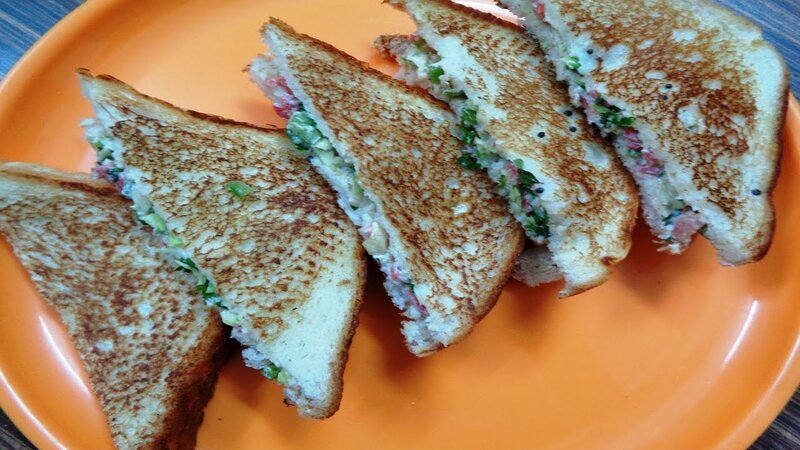 Serve these mouth drooling curd sandwiches steaming hot with green coriander chutney, tomato sauce, mayonnaise or any other dip as per your taste and relish eating. If you like consuming ghee then apply some ghee on the inner side of the bread slices as well prior stuffing them up. If you don’t relish consuming ghee then prepare these sandwiches without ghee. You can use white or brown bread slices for preparing these sandwiches.